Come stay at Kammy Hostel and experience a hostel unlike any other in Marrakech. What makes Kammy Hostel so special? Our hostel was built with love by three friends, all from different places but with one similar dream: to show everyone what we love so much about Morocco. 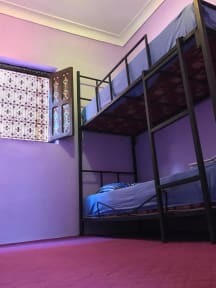 It doesn’t matter where you’re from in the world: you will immediately fall in love with our intimate, traditional hostel. Once you walk in the door, you’ll find Kammy Hostel to be your new home in Marrakech. Located in the heart of the medina, Kammy Hostel offers travelers an authentic Moroccan experience outside of the typical tourist bubble, surrounded by vibrant, local souks, vegetable markets, juice and pastry shops, and many more Marrakchi secrets you won’t find close to other hostels. The hostel is tucked away in the medina but just a few minutes walking from the main square, Bahia Palace, and the Marrakech museum. Kammy Hostel features a large terrace, wifi, free Moroccan breakfast, complimentary mint tea whenever you like, and of course endless Moroccan hospitality. We have 24 hour reception and staff who are happy to accommodate you with anything you may need during your stay. So what are you waiting for? Come find your new home in Marrakech and discover what surprises await you in the heart of the medina.